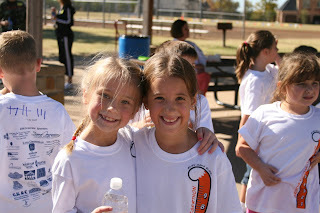 Aubrey's school held their annual Tigerthon fundraiser on Friday. The weather was perfect this year! 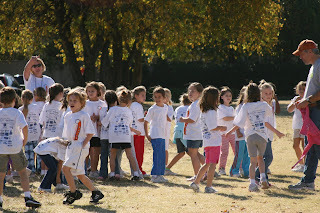 The children run/walk laps for 20 minutes and family/friends can donate a dollar amount per lap to raise money for the school(basically, its manual labor:) Ha ha. Anyways, the kids love it. 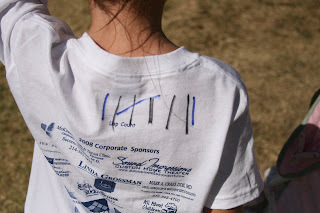 They get Tigerthon T-shirts and every time they run one lap, they get one "mark" on their shirt to keep track of laps. In P.E., they had been "training" for weeks. Aubrey was ready to rock n roll. Getting ready to race! 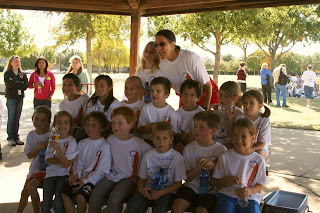 Aubrey is the one with the blue pants in the middle. Run Tigers run! Aubrey and her buddy Courtney run side by side. We're proud of you Aubrey! You ran sooo fast! p.s. Aubrey posted to her blog today. Check it out! That's a great fund-raiser idea. It gets the kids to use up some energy and the school gains something from all of their hard work. Great running Aubrey. We are so proud of you. I don't think Nana would make it to eight laps. I'm very ashamed to say but at least I can say my granddaughter can do it and do it well. Your smile at the end says it all. Love the music it's perfect. Sending our pledge. What a fun idea to raise money. 8 laps Aubrey, I'm impressed! Good job!! Okay Holly, this is tooo funny. As I first looked at this post and pictures, I automatically started humming the Chariots of Fire song. Then when it started playing, I almost peed my pants laughing. Way to go Aubrey!!! Congratulations Aubrey! You are awesome! Way to go Aubrey! Next the St. George Marathon!!! Now that is just seriously the most adorable thing! way to go Aubrey! 8 laps is amazing! LOVE the Chariots of Fire music!!! What a great idea! Way to go Aubrey!!! You rock girl! Go, Aubrey! I love reading stuff like this -- she's awesome. Way to go Aubrey. 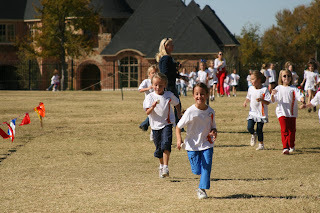 What a good runner you are. Good job Aubrey! I'd be passed out on the floor if I ran sprints for 20 minutes. Hooray for Aubrey!!! 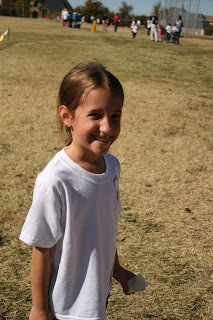 What a cute girl and what a great motivator for the kids. She is a runner, that one! Our family finished the Book of Mormon! Back to your regular scheduled programming. . .